This entry was posted on June 17, 2014 by Jessica Anderson. We love how our customers really get into their events. We see it all the time with fantasy football, chili cook-offs, and other parties. It's amazing how creative people can get with the awards, building hype around their competition. Today I'd like to feature customer Dale McMillan, who hosts the Golden King O' The Kitchen (KOK) event each year. Our resin chef trophy has become the mascot of his event, even featured in the invitations. If you read Dale's story below, you'll see why we renamed the trophy the 'King O' The Kitchen'! 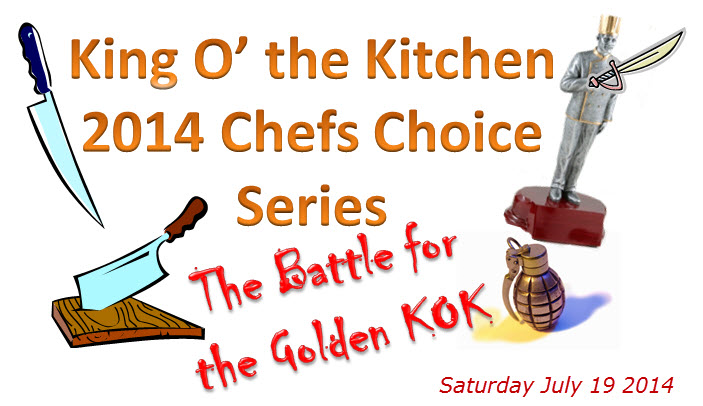 From customer Dale McMillan: "Trophies2Go actually has a large part in the now yearly event, as the first place trophy has become known as the Golden KOK (King O'The Kitchen) which is hilarious funny. 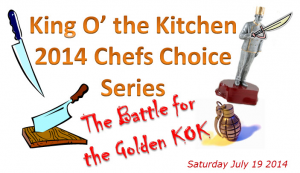 This year's Golden KOK event is July 19th." "This year as a twist it is "Chef's choice" meaning that mystery ingredients and themes are submitted by the chefs themselves rather than myself. Everyone that attends votes for their favorite dish." "Oh by the way, you may notice the head missing from the second place trophy in the picture, that was because Martin was so happy to win he raised his arm in triumph and whacked the trophy on the roof and snapped it off!! Hilarious! I was going to complain to you that the necks are not strong enough to survive blunt force trauma!!!" "You would not believe the fun! Fierce competition!" Thank you Dale for sharing your story with us! Wishing you a fun and tasty event in a few weeks! If you would like to share the story of your award with us, email me at [email protected]. I'll post pictures on our Facebook page and maybe even write a blog about it. We love hearing about how our awards make a positive impact in the lives of our customers!